In Bill Black’s development of his poetry, he understood that written poems are the same as a musical score written on a page or a script provided by a playwright. These are all representations of the creators’ intended work. It remains for the performer of the work to find the intent and convert it to meaning and feeling for the audience. As with all art of this type, it is best done in live contact between the performers and the audiences. Unfortunately, in an increasingly rushed and urbanized world, there are fewer chances for audiences to gather and experience live performance. As Bill traveled giving different shows and presentations, he found that he was often the first performer, other than musicians, that audiences had experienced live. They enjoyed the experience and wanted to experience more live performances. At the same time, he saw that there were few people who wanted to seek out and read poems and poetic stories for many reasons. He chose to use an oral form to help these audiences. The Compact Discs are a way to provide a high quality sound presentation in an easily used and transported medium. They can be “played” in numerous ways while in the home or at work or while traveling. They also present the works in a way that the audience can better understand the intent and meaning of the works. The two discs were developed as companion works. Each is a complete, “stand alone” work, but as a pair, they show the continuing richness of what we love of the American West. If you would like to purchase either of the disks or both, please use the integrated shopping cart found next to each CD track listing. 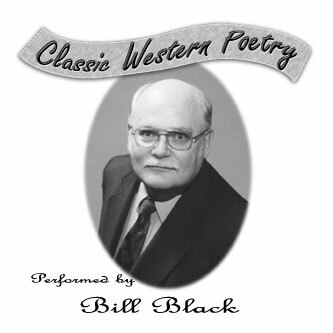 Bill’s first CD is a collection of American works depicting the West as it was between 1890 and 1920. He selected the poems to be performed from the works of three poets; Arthur Chapman; Robert V. Carr; and, Earl A. Brininstool. He introduced the work with an original theme setting piece of his own, “Time, Like The Wind.” The CD was recorded and produced in the Spring of 2002. The Academy of Western Artists, in their Eighth Annual Will Rogers Awards for Outstanding Achievement of Contemporary Cowboy Skills chose "Classic Western Poetry" as one of the selections in the Top Ten voting for the Poetry Album / CD category for 2002. Performed and produced by W. E. Black, Jr. 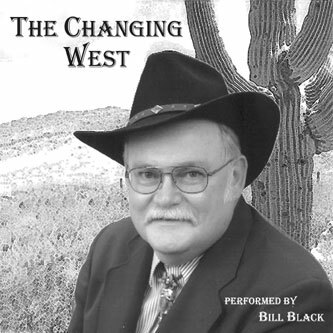 The Changing West is a collection of Bill’s original works. They reflect the continued changing that was seen in the early part of the twentieth century. It also pictures the characters one now finds in the Southwest. There is a “bonus” section in which two of the war / military theme poems are presented. Also added is a poem often requested as Bill performs, “Do You Love Enough?” An additional tract is a humorous story of the type Bill uses in his shows and presentations. This CD was recorded and produced in the late Summer of 2002. 19. Do You Love Enough? Written By W. E. Black, Jr.